Jayapur looks like a village straight out of a government brochure. The village has pucca roads adorned with solar LED lights. Villagers have a solar water pump installed by Union Bank. The primary school is clean and neat and has a mid-day meal. It also has a ‘Smart Class’ by Room to Read, an NGO facilitating the infrastructure & trainers, once a week for students from Class 1-5. 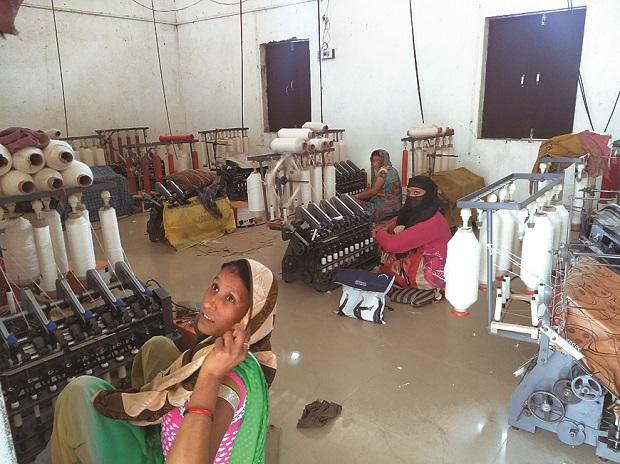 Jayapur is one of two ‘model’ villages adopted by Narendra Modi in 2014 and has seen a rush of companies and money. The gram pradhan, Narayan Patel, dressed in an orange kurta, said the real development started only from 2017 onwards when the funds came in. “Before 2017, the Samajwadi Party government in the state stalled the funds meant for our village. Till 2016, we were getting Rs 1 lakh per year. Now it is Rs 12-15 lakh a year,” said Patel, a BJP worker before rushing off to lead a bike rally in honour of Indian Air Force pilot Abhinandan Vardhman. Ever since Jayapur village was adopted under Sansaad Adarsh Gram Yojana (SAANJHI), government departments and private companies have tried to make their presence felt. Government schemes for the village have worked out better than those of private company schemes; some are no more than a nameplate. SAANJHI was announced by the Prime Minister in his first speech at the Red Fort on August 15, 2014. The scheme envisioned the integrated development of the selected village across agriculture, health, education, sanitation, environment, and livelihoods. The goal was to develop three Adarsh Grams (model villages) by March 2019, of which one was to be achieved by 2016. Thereafter, five Adarsh Grams (one per year) were to be selected and developed by 2024. A two hour drive from the PM’s constituency of Varanasi, Jayapur and the second village, Nagepur, were to be declared Adarsh Gram by 2019. There has been no such announcement yet. Both villages are work in progress. In Jayapur, a building bears the name Kashi Adarsh Kanya Vidyalaya — a higher secondary school for girls — but it is actually a yarn spinning unit run by Krishak Vikas Gramodyog Sansthan with Khadi India. Villagers were told the school was going to be built by the Avaada Foundation which runs two solar power plants in Jayapur. In the past four years though, no infrastructure has come up and no teachers. Queries addressed to the Foundation spokesperson remained unanswered. “After we gave the school building to Khadi India, 40 women work and learn spinning and weaving. The women are paid between Rs 1,000 and Rs 10,000 per month,” said one of the persons overlooking the centre. Women in the two villages have been the target of many government and private initiatives, mostly through the National Rural Livelihood Mission (NRLM) which aims to provide financial services to self-help groups and individuals to make them self-sustainable. Most of the women have started a training centre for stitching and weaving. One woman runs a computer learning centre for girls. Another woman, called Soni, took a loan under NRLM and started a DJ band for weddings. She has repaid her loan and is famous in the surrounding villages. “Modiji se mile computer pe, unhone shabhaashi di, naam bataya hamara sabko,” Soni said. (I met PM Modi via video call, he complimented my work and even mentioned my name in his speech). In the middle of Jayapur village is Atal Nagar, a community housing project for 14 Scheduled Tribe families. Set up in 2014, the two-room houses have a kitchen, two bathrooms and are lit with solar power and battery systems installed free by Tata Power Solar. Of the 14 families, only five use their free gas connection given under the UJALA scheme. No one has got a refill for more than a year, as they have to pay the full amount for a refill upfront and wait for the subsidy to come later. The passbooks of some women tell a sorry tale. They are devoid of entries — no pensions for senior citizens, widows and other schemes for over two years — due to lack of awareness. Both Jayapur and Nagepur lack a basic health centre and hospital, schools above the 5th grade, and government skill training centres. Nagepur looks like a ‘before picture’ of Jayapur. Nagepur was the second village to be adopted in 2016. Its story is similar to Jayapur’s though it lags behind. The primary school is as same as its neighbour’s but there is no school above 5th grade. There are no solar lights on the streets. Gram pradhan Paras Nath claimed that one solar power plant was installed by Vedanta and it was supposed to pay the farmers. “But they didn’t pay and when we contested, they uprooted the panels and went away,” said Nath. The aanganwadi centre, though, was built by Vedanta, he said. For Nagepur’s employment officer, it is frustrating that no training centre for youths had been set up. Nor are they getting jobs under the NREGA scheme. “Even the payment for panchayat workers under NREGA is stuck for two years. Even I have not been paid,” said Rekha. She complained that girls have to travel seven kilometers for higher schooling. Pregnant women either opted for the village midwife or were rushed to a health centre eight kilometers away. At a computer training class, girls sit in rows learning how to use the internet. In another room, sewing classes are underway. The classes are in a centre run by Punjab National Bank which also operates farmer skill training classes. “There is so much talent and aspiration in Nagepur. After we got adopted, we got used to being hounded by the media,” said Rekha. “Hum vikhyaat ho gaye, aadarsh ka pata nahin,” she said. (We have become famous but I don’t know about being a model village).